Browse our large collection of free invoice templates. Our selection ranges from invoices for service providers to billing statements and rent receipts for landlords. If you are looking for a simple low-cost solution for invoicing your clients, these invoice and billing templates are a great place to start. Vertex42's collection of invoice templates were designed to work in almost all spreadsheet programs, including OpenOffice and Google Spreadsheets! Most of them also work in the new mobile apps for Office, such as Excel for iPad and iPhone. A simple invoice template that is easy to customize for freelance services, legal, accounting, and other small businesses. This basic invoice provides an extremely simple design, including only the most critical elements of an invoice. Create and print a simple invoice using this Microsoft Word template. This is a great general-purpose invoice. The "Bold" theme for our new easy-to-use invoice template. This is the "Light" theme for the Simple Invoice template. A professionally styled invoice template for services charging by the hour. A powerful invoice manager for creating and tracking invoices. Easily track the status of all your invoices. For service providers and consultants. The "Bold" theme for the new consultant invoice template. The "Light" theme for the new consulting invoice. A billing statement can be used as an invoice as well as an accounts receivable ledger. For the sale and shipment of products. Invoice with or without a remittance slip. An ink-friendly printable blank invoice. If you have a tenant who does not always pay the full rent on time, you can use this rental billing statement to send reminders of amounts due. Includes vehicle information and separate sections for services and parts. Used similar to the way a sales quote would be used, but designed especially for international and domestic shipping. A simple method for printing packing slips. Designed to compliment the sales invoice. Print a page of cash receipts for payments you receive by cash, check, or money order. An easy way to create a receipt is to slap an image across an invoice to indicate that it has been paid. Create price quotes to send to your customers (based on the free invoice template above). An easy-to-customize job estimate form for creating a work estimate for services, repair, or basic construction. Create work orders for maintenance, IT and repair work. Customize a simple quotation template for your business. 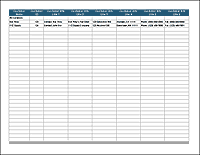 This purchase order template includes a price list worksheet. Select items from the price list via an in-cell drop down list. Track the status of all your purchase orders, regardless of what PO form you use. Track hours worked, for billing purposes. Great for freelancers. Add a Customer List worksheet to your invoice, work order, or other worksheet. Includes instructions for how to set up a drop-down list and create lookup formulas. Create a professional looking price list for your products and services.